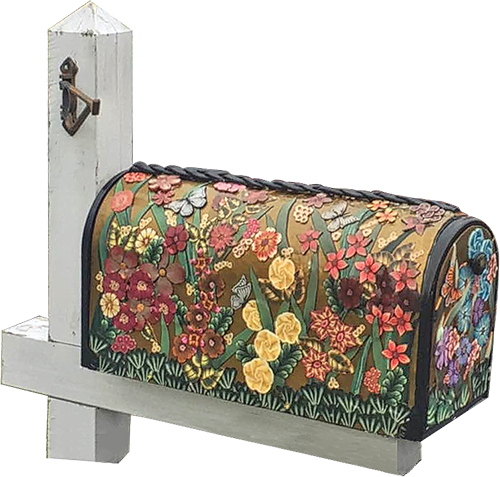 Maryland’s Carol Lessans prefers to receive her mail in style. Her first polymer-covered USPS box lasted four years in rain, sleet and snow. The time for replacement coincided with Carol’s first class with Lynne Ann Schwarzenberg last June. “My first flower morphed into a summer-long study and resulted in a garden of blooms. But where to plant this garden,” Carol wondered. She used slices of her flowers to cover a new box and in the process, she and Lynne Ann became great friends. 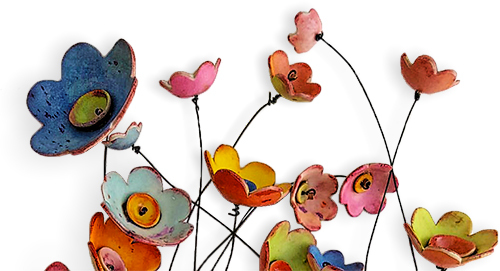 Consider adding some polymer blooms outdoors this spring. Have a happy weekend. And join us on StudioMojo for the rest of the week in polymer. It’s no secret that crackle has crept into polymer art. There was fine and faux, painted and pulled. All kinds of variations. And now maximum crackle from Serbia’s Ursa Polak appears. If you’re a crackle fan, you probably love it all. Ursa’s version glints with gold and has a distressed relic feel about it. You’ll have to guess how she did it. Look her up on Flickr and her blog. How cracked up are you feeling? Ever since I took a class with Carol Blackburn in Santa Fe, I’ve had an art crush on her impossibly fastidious patterns and the way she makes it all so simple. 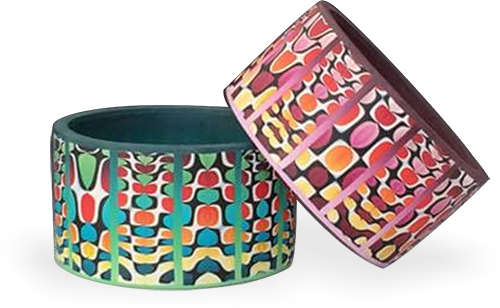 Carol will teach some of her clever tricks at a 3-day Purses, Bangles and Beads workshop at Galerie Freisleben in Germany in June. What a dream that would be! In the meanwhile Carol keeps coming up with more head-slapping designs like this Loopy Links necklace. Of course these softly blended oval shapes would fit into each other. Why didn’t we think of that? Spring is a great time to let your own loopy ideas take shape. We can all get up and do a little happy dance that polymer clay is making its appearance in the National Museum of African American History & Culture in Washington D.C. thanks to the work of Ohio’s Debbie Jackson. She will be offering two series of designs for sale in the museum shop. 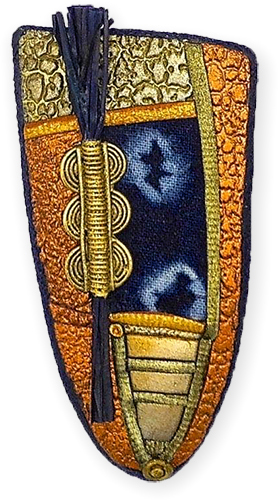 Debbie’s indigo line shown here combines polymer clay, indigo fabric, African brass, metallic foils and raffia into a powerful group of shield shaped pieces. See the rest of her designs on Facebook. Debbie is also working with DC sculptor Woodrow Nash to produce beads and pieces that will embellish his dramatic figures. It’s been a banner year for Debbie full of paperwork and negotiation and waiting. Debbie has long been known as a talented and persistent artist and teacher here in our home town and we’re very proud of her. She shows us all how hard work pays off. New Zealand’s Amba Jacobs (TheLittleMew) makes small sculptures and charms based on games and comics and popular culture icons. Here the 2.5″x3″ Dusky Sky Lantern Dragon’s body and feather-like scales are rendered lovingly in pastel sunset colors. It was one of three sculptures auctioned off recently. When she was a child, Amba liked to rescue kittens, drawn by their vulnerable mews. “My spirit charms are also small, sweet and fragile creatures who want to be adopted,” she says. 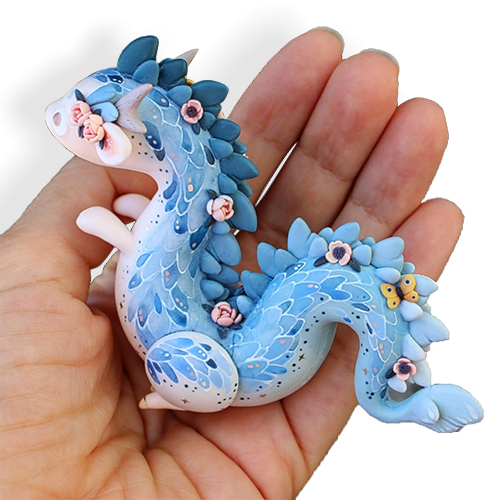 She sells her creatures in several online venues (Etsy, Facebook, Instagram, her blog). She shares her methods on her YouTube channel. Her attention to detail is apparent not only in the carefully crafted works but also in her approach to placing them in good homes. Do you feel like your artwork is up for adoption? A pretty tangle of polymer flowers from Greece’s AnarinaAnar rounds out PCDaily’s week. 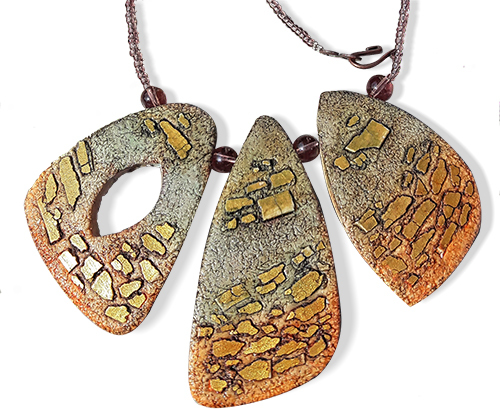 Her pieces have a distinctive look with ceramic-like speckled finishes and dark edges that provide contrast. These flowers bobble on thin wires. There’s a spontaneous quality about her work that starts the weekend on the right foot. Check Flickr, Facebook and Etsy if you need to soak up more of her cheeriness.